No output is a good thing. It means no obvious error. Can you also run dmesg -w and then re-run sudo /etc/rc.local and post the new dmesg output? I had to reload the image and followed the directions in the wiki more closely and the display works. I really appreciate everyone's help and suggestions. Thanks. Also how do I stop the keyring unlock window from always popping up at startup? The option to stop it is greyed out. ind1fference wrote: Thanks. Also how do I stop the keyring unlock window from always popping up at startup? The option to stop it is greyed out. The first time you use it it's gonna ask for a password, if you enter a password it will always ask for the password, if you do not enter a password it can work without but passwords and settings (WiFi) will be stored unprotected in the keyring file. If there's already a password set you can remove the keyring in the .gnome2/keyrings folder and start with a new blank one. And the password is always "odroid" by default. What needs to be done to use a bluetooth controller? check if blueman is already installed, if not install it and start it, it's a graphical frontend for bluetooth devices. ....now another issue. 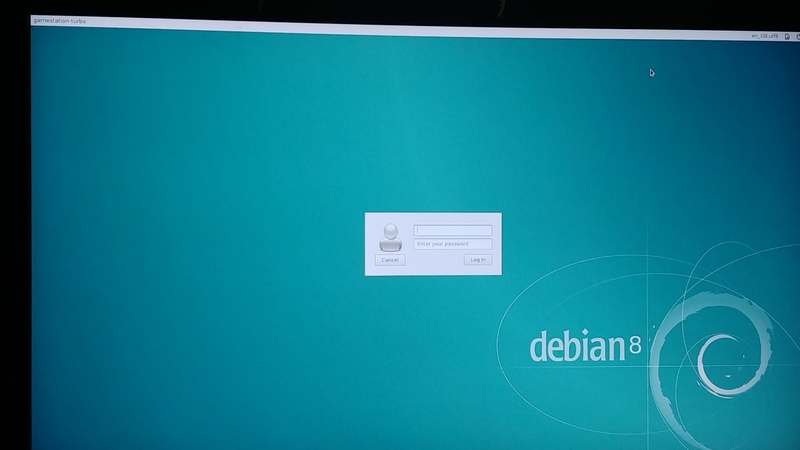 I simply restarted and now I have see an aqua login screen that says 'debian8'. A "successful" login just results in the same page reloading. WT? This "boot" into emulationstation have you done that manually or did you use the setup tool on the desktop? I did it with the setup tool on the desktop. hmm this doesn't touch the login screen in the least, it only replaces a file under /home/odroid/.config/autostart/ which is AFTER the login when the desktop is already loaded. So it should not affect the login in the least. I just tried it on my ODROID and it worked perfectly fine. I saw the desktop for a split second then ES booted up and now I'm sitting in ES. Can you check /var/log/syslog if you see any issues? Maybe there's a file damaged or something. which shouldn't show up at all, as the system is set to auto-login. Anyway yes you can access other things, just press CTRL + ALT + F1 to go to VT1 here you can login as root with password odroid and navigate through the system. Using "mc" (Midnight Commander) should make it easier to navigate through the system you can use arrow keys to go up down, enter to open a folder and F3 to read text files. It's a rather handy tool. I will keep that keyboard command in mind. Thanks. At this point you're already logged in. it complains that the "command" "odroid" that you entered is not a valid command, means you have to be logged in to even be able to enter "commands". So just type mc / as a command. I'm hitting enter but syslog won't open. I appreciate your patience. 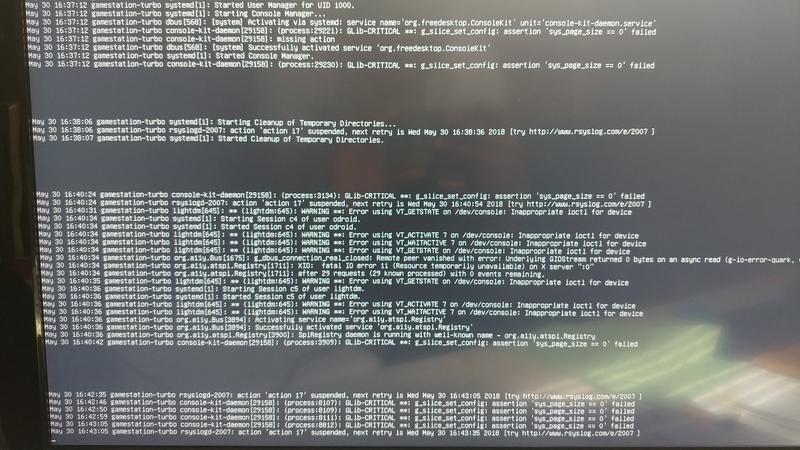 I haven't used linux in a long time and I can't fathom why nothing seems to go smoothly with OGST. as I said, reading files is F3, enter can be used for navigating and to start files, or to open (navigate inside) compressed files such as .zip files etc. There's so much here and I don't know what I'm looking for. I'm lost. I'm wondering if my SD has an issue because there was no degradation of performance or warning signs just a restart and an unexpected login screen. 6. switch back to CTRL + ALT + F1 and check what was written in the log when you tried to login. Shouldn't be too much text.. if it's still more than one page, you can go UP a page by pressing SHIFT + page UP that should allow you to scroll a few pages up and down... it's hopefully something obvious. 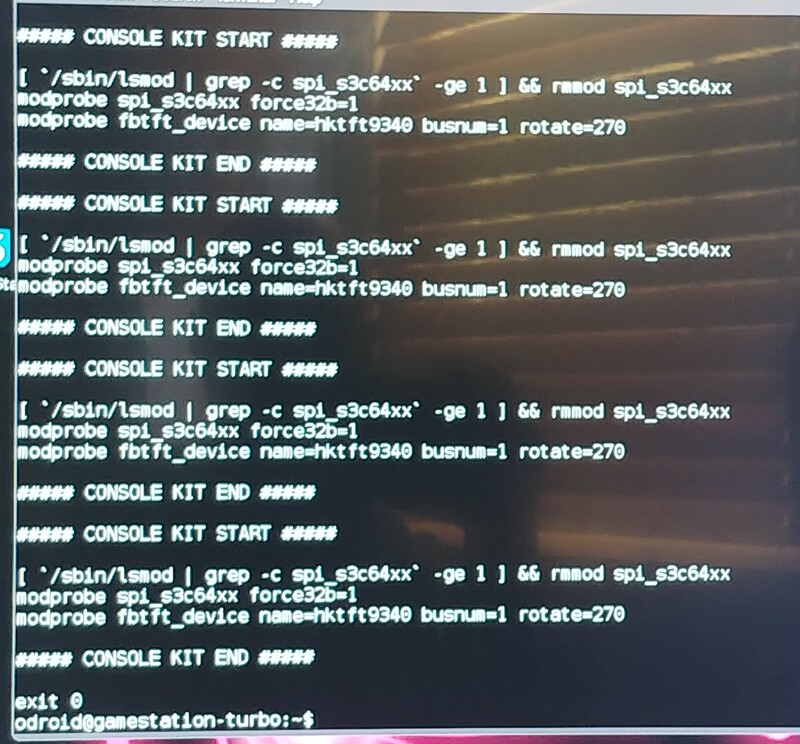 One of my guesses, the files under /home/odroid/ do not all belong to odroid anymore, but some might have been altered by root and odroid no longer has access to them, causing the system to fail login as it can't write the files. If that's the case you can try chown odroid:odroid -R /home/odroid to make sure all files belong to the user odroid. Once that is fixed the system should act normal again, IF that is really the problem currently. If not, I hope the syslog tells us what it is. I'm beginning to think that this image may just not be for me. Last edited by AreaScout on Thu May 31, 2018 1:26 am, edited 2 times in total. ind1fference wrote: I'm beginning to think that this image may just not be for me. have you tried that command I gave you with chown? 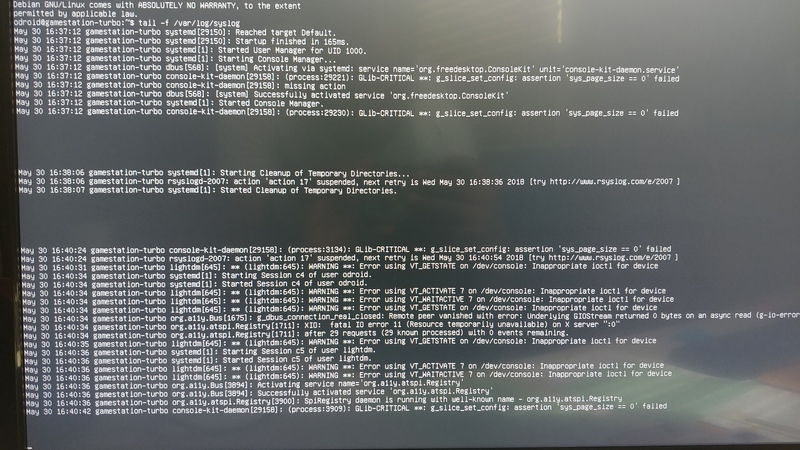 It looks like something is not correct... it says fatal IO error and ressource not available for :0 which is normally when it tries to connect to the X-Server. I still think something got messed up with the permissions. This is not the default behavior of the image, so I wonder how that happened. If there's nothing important on the image yet you can always start from a fresh image. Once again, this is not normal behavior, but something is broken. Good looking toolkit you have designed, I look forward to eventually using it. I am having an issue, the logo.mp4 is not playing when I run PSX games for some reason. Can anyone help me, what do check or do? All the other ones are loading fine. psiquik wrote: I am having an issue, the logo.mp4 is not playing when I run PSX games for some reason. Just tested PSX on my side it's working fine. can you try to start it manually to see if it works? What do you mean by skips it? Scrapping or just to show them in the overview? Scrapping can be repeated, sometimes not all sites are up and you can restart the scrapping process, by pressing C and selection to rescrap the selected game. yes the rom collection browser is actually a very old project and was kinda dead for a couple years, it recently started development again and I'm looking into it to see if it works better now. You can always re-scrap the collection and see if it works. Maybe disabling mobygames for now as this is the one often causing issues. So sftping roms just resulted in Filezilla erring everything out and upon a restart I'm looking at the aqua Debian 8 desktop again. I give up. GameStation is trash for me. No fancy LCD for me unless another image starts using it. Shame. ind1fference wrote: So sftping roms just resulted in Filezilla erring everything out and upon a restart I'm looking at the aqua Debian 8 desktop again. I give up. GameStation is trash for me. No fancy LCD for me unless another image starts using it. Shame. How are you flashing the OS, with what hardware? Are you using MicroSD to SD? What SD card are you using? What power supply? Something is causing you to have issues. I've used etcher each time and I'm on my 6th-7th attempt to get it to work. There's always an issue once I start copying roms via sftp. I eventually restart and get the aqua desktop and I'm unable to get back the default debian desktop. I'm using a 128GB Samsung EVO Select micro SD card. This card never gave me problems on my raspberry pie. But how are you flashing the SD? You need to use a micro SD to USB writer. You can't use the SD to micro SD adapter. I'm not saying it's your SD card, that's a good brand. What power supply are you using? It needs to be 4 Amp. I'm flashing it with a usb3.0 sd adapter. I'm using the power supply that came with the OGST kit. It kinda looks like .Xauthority or something got messed up. like someone messes up the permissions. Which user do you use for sftp? Also I wonder why Filezilla is touching these files at all when you copy ROMs. Odroid/odroid is my login for sftp. It's odd. Usually the first 2 thousand files transfer fine then the whole queue fails. So I restart and then I get the wrong desktop. A ton of information scrolled across the screen. Of what's visible, it's hard to determine what went wrong. I do see 'pd-sp can't add device 131aoooo.spi' in red...twice. could it be that you filled the rootfs to 100% during file copy? If the rootfs is 100% full login should also fail as it can't create certain status or log files anymore. Also I still think there are some SD cards that have issues with the XU4, meaning that their filesystem get's damaged while the system is "running". That is why I prefer eMMC or HDD instead, especially for large images with lots of ROMs and such. Please let me know, I wouldn't mind ponying up some more dough to pull in another Odroid XU4 to use with the Cloudshell since I generally like to have all my electronics doing work and not go to waste! Generally it should work with the Cloudshell 1 as well, not sure if it can achieve the same speed for playing videos, but yes it should be able to display the same on the Cloudshell 1 as well. Looks really good.. you should check if the shadertoy visualizer works that is used for Kodi, that thing is amazing and good looking. meveric wrote: Looks really good.. you should check if the shadertoy visualizer works that is used for Kodi, that thing is amazing and good looking.